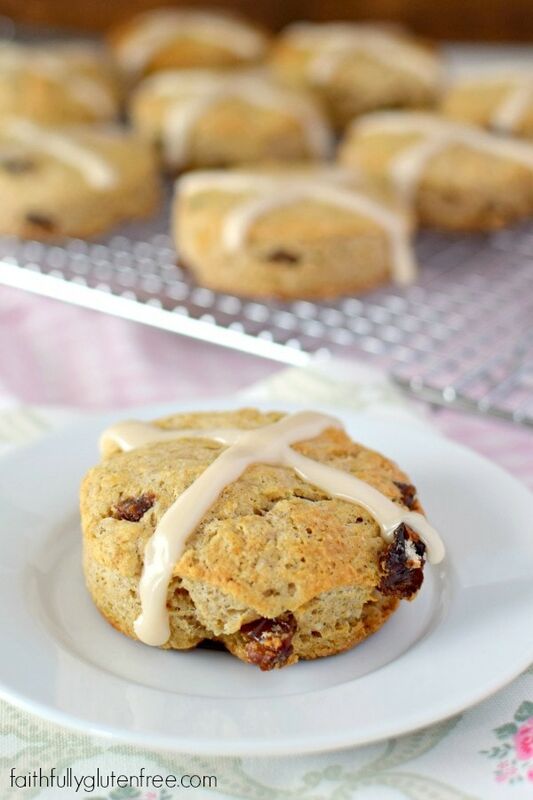 Filled with raisins and spices, these gluten free Hot Cross Scones are hot from the oven in under 30 minutes, making them perfect for Easter brunch. Over the years, I’ve toyed with converting the breads that we would eat at Easter to gluten free. 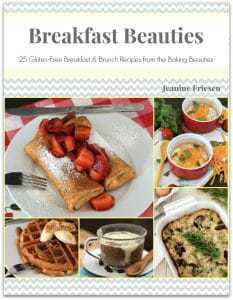 Although I do have a recipe for gluten free Hot Cross Buns, it was my first year of blogging, and it is actually a recipe from the bread book by the gluten free gourmet, Bette Hagman. I have been meaning to create my own version of the recipe, but haven’t gotten around to it yet. 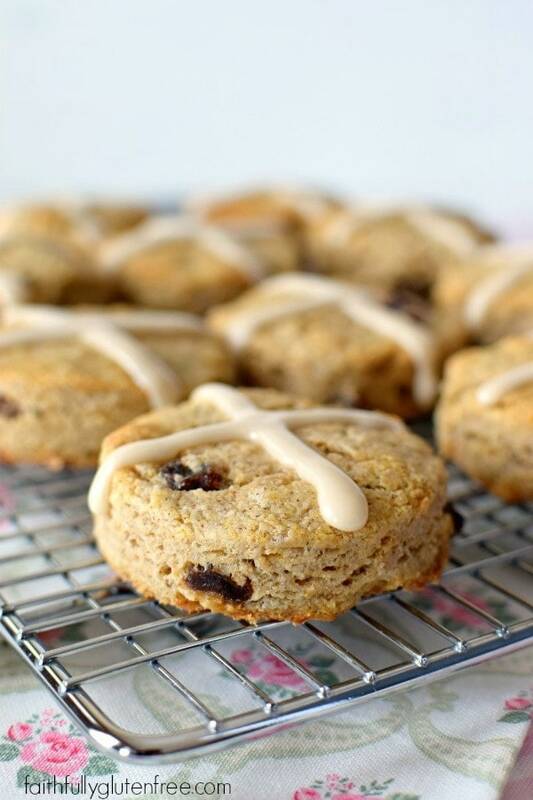 I have, however, incorporated the flavour of these Easter buns into gluten free Hot Cross Scones. Scones are really easy to make, and can be ready to eat in under 30 minutes. My secret to easily making scones or biscuits is to grate the cold butter into your dry ingredients. No need to worry about large lumps, or working the dough too long that the butter bits get too small. You get a nice, consistent distribution of butter this way. To clean my box grater off after, I put some of the dry ingredients onto the butter that remains on the grater, and just rub it with my hands. Most of it will come off this way, and I won’t be handling the butter directly. I used raisins in these gluten free Hot Cross Scones, but you can feel free to use currants, or even add some citrus zest, if that is what you are used to. The scone tops are decorated with the signature cross that makes them resemble Hot Cross Buns. Preheat the oven to 400 degrees F (205 degrees C). Line a baking sheet with parchment paper. In a mixing bowl, whisk together all of the dry ingredients. Stir in the raisins or currants. The easiest way to make great biscuits is to shred your cold butter directly into your dry ingredients. I like to use my box grater for this. You can also use a pastry blender. You want to handle the butter as little as possible, so it stays cold. Stir the shredded butter into the dry ingredients. In a separate bowl, whisk together the sour cream and eggs. Stir this mixture into the dry ingredients, just until the dough comes together. Scrape the dough onto a sheet of waxed paper or parchment paper dusted with a little bit of rice flour. Place a sheet of plastic wrap over the dough, and press it together so that it forms a ball. Roll the dough until it is about 3/4-inch (2 cm) thick. Use a round cutter to cut out the scones, or just cut into squares or wedges. You can re-roll the off cuts, but try to not add more flour when you do this. Place the scones on the prepared baking sheet. Brush the tops with milk (optional), and bake in the preheated oven for 13-15 minutes. Remove from the oven, transfer to a wire cooling rack, and allow to cool completely before icing. Stir together the confectioners' sugar, milk, and vanilla until smooth. Add enough milk so that the icing is soft, but not runny. Transfer the icing to a resealable bag, and snip off one corner. Pipe a cross on the top of each scone. If your raisins or currants are very dry, re-hydrate them before adding them to the scones. To do this, simply place them in a microwave safe bowl, cover the dried fruit with water or orange juice, and microwave for one minute. Allow the raisins or currants to sit for a few minutes before draining. Shake off any excess liquid, because you don't want to add extra liquid to the scones. Disclosure: This post may contain affiliate links. If you make a purchase using these links – your cost remains the same, but I earn a small percentage to help support this blog. Thank you! HI -I am so grateful for all of the recipes that you post!! I have a question-I made some cookies this week and they spread out on the baking sheet. Although they taste just fine, they don’t look “right”. The ingredients were at room temperature to start and I watched them in the oven. Before I put the second batch in I tried leaving them in the fridge for awhile to see if that would stop them from spreading out so much-no luck. It was a recipe I found in a magazine-it had almond flour, potato starch, coconut oil, an egg, some vanilla, baking soda, salt and some sugar it. This has happened before and I don’t know what I am doing wrong-any suggestions would be helpful. Thanks! Jeanine, you’ve done it again! Read the recipe at 4am (don’t ask..) started at 5, out of the oven and kitchen cleaned up by 6, on my way to work with them shortly. Unbelievably light, lovely texture & flavor, no grit. Much better than the $5 – $10 scone mixes I have picked up. I scooped, rolled in wet palms, and flattened slightly, instead of roll/cut. The first hot cross buns I ever ate were from a Bohemian bakery, and had custard crosses, not icing. I dug up a recipe: 100 ml milk + 20 grams white sugar: microwave in glass cup to boil. Meanwhile, mix 1 egg, 20 g white sugar, 10 g starch (I mixed tapioca, potato and corn 6-2-2)+ 50 ml milk. Drizzle hot milk into egg mix slowly, stirring, then cook on stove stirring constantly until thickened. Stir in 17 grams butter (which I forgot.) I cooled pan in a couple inches of cold water in the sink while I mixed n shaped the scones. By the time scones were on the parchment, custard was cool. Slash scone tops with wet knife, pipe custard into slashes with a ziploc bag (tip cut). Custard would be enough for 2 or 3 batches. (Meant as filling for danish pastry; recipe here is 1/2 their recipe.) Bake as usual. Yummmmm. I don’t have the custard recipe source handy; I scribbled it off the internet longhand instead of printing it so I don’t have the attribution. Will try to find again and forward to you. After work. I found the custard at http://videoculinary.com/recipe/pastry-cream-danish-pockets/, saw it in print at that site as well as a step by step youtube video. I used 1/3 recipe (original called for 3 eggs, I cut to 1 egg size) made a second batch of scones after work tonite to bring to church, and still have some pastry cream left, enuf probably for a 3rd batch. I would like the custard just a little thicker – next time would experiment with the starch mixture. Have made your scones now twice – once with spices and raisins (plus some diced candied lemon peel and diced dried apricots) and once with vanilla and chocolate chips. It’s a winner.